The periphery tape. exemplified by Pi Tape® brand tape, provides a quick, accurate and easy method of reading true diameters of both round and out-of-round forms. Perfect for measurement of thin or soft walled parts - large or small. Pi Tape gages consist of a narrow metal ribbon bearing special graduations. These graduations are designed to convert circumferential distance into diameter measurement so the observer can read the diameter directly from the scale. Tapes are checked over master gages at .001'"(.03mm) accuracy for standard tapes up to 144" (3600mm). Certificate of accuracy traceable to National Institute of Standards and Technology is furnished. Pi Tape gages are a precision tool made of 1095 clock spring steel (on request 420 stainless steel - for use in a corrosive atmosphere). They require a minimum of maintenance, but we do recommend a quick wipe with an oil moistened cloth after use. A light gun oil works very well. Make sure the tape has not been dented or kinked. This may affect the accuracy of the tape. Pi Tape gages are invaluable tools to the aero-space field as well as the plastic pipe industry. The variety of uses are infinite. In stock... tapes ranging from 3/4"-7" to 132"-144" diameter available for same day shipping. In stock... tapes ranging from 38-200mm to 3300-3600mm diameter available for same day shipping. Standard clock steel will be supplied unless specified otherwise. Calibration Report traceable to N.I.S.T. furnished with each new tape at no additional charge. In the illustration the divisions to the left of the Vernier zero are 20 inches plus 1 division, or 20.025. The 15th line on the Vernier coincides with a line on the Gage Member. This is added to the 20.025, making a total diameter reading of 20.040, which is the true diameter reading as measured on the outside circumference. When reading the tape, apply a snug pull of 5 lbs. tension, first making sure the tape and part have been properly cleaned. When using a standard O.D. tape on an I.D. surface, add double the tape thickness to the reading to arrive at the I.D. of the part (0 lbs. tension). It is suggested that direct I.D. tapes be used for Inside Diameter readings. Each line on the Gage Member of the tape represents .5mm of Diameter, while each line on the Vernier represents .01mm. The zero on the Vernier is past the 661.5 line on the Gage Member of the tape. Now find the line on the Vernier which corresponds exactly with the line above. The example shows it to be the 23 line which equals .23mm. This added to the 661.5 reading gives an outside diameter of 661.73mm. When reading the OD tape, apply a snug pull of 2.25kg. tension, first making sure the tape and part have been properly cleaned. 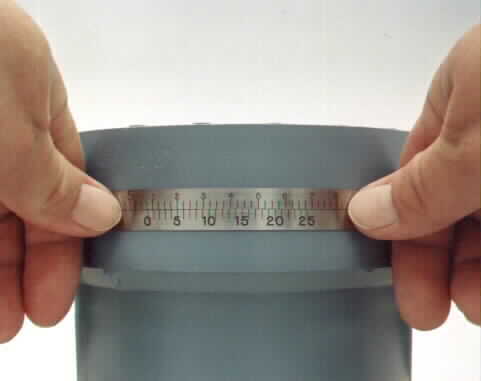 Inside diameters can be read in the same manner by adding double the tape thickness to the reading using the standard outside diameter tape ( 0kg tension). Standard tapes are .25mm thick; thus .50mm would be added to the reading. It is suggested that direct I.D. tapes be used for Inside Diameter readings. As a suggestion for checking very large diameters-pieces of masking tape may be used to hold the tape in proper parallel position. When not in use, wipe clean and apply a light rust preventive oil. Store in tape container. No periodic adjustments are needed. Make sure the tape has not been stepped on or kinked, which may destroy the accuracy. May have one or more sets of ABC dimensions on one tape. Anytime "o" line falls between A B C lines part is within tolerance. The minimum diameter distance between lines is .004" (.12mm). an economical alternative when an accuracy of .01 is an acceptable tolerance.